Animated Airblown Shivering Snow Couple is such a cute addition to your Christmas yard decor! 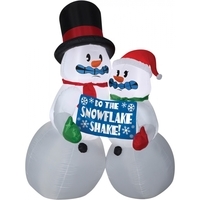 Holding a funny banner saying, Do The Snowflake Shake! Airblown gives your decor maximum impact with minimum effort and it comes with everything you need for quick and easy set-up. You just stake it down and plug it in. Lights up with clear LED lights Self-inflates in seconds Deflates for easy storage Made of Fabric,70%; Plastic,20%; Metal,10%. Measures approximately 72 inches tall, 51 inches wide, and 59 inches deep.